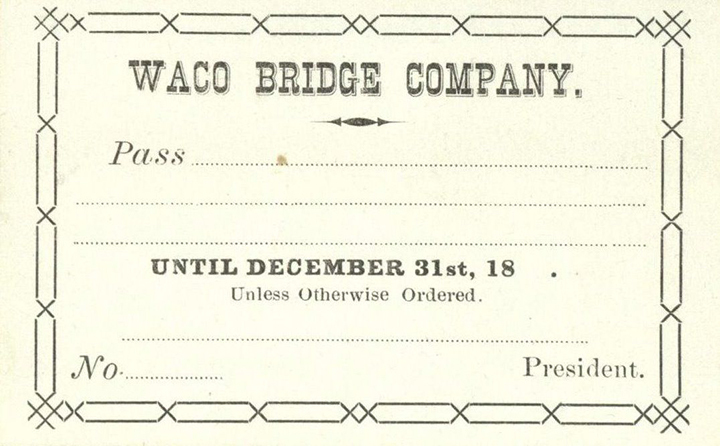 Waco Bridge Company records, 1868-1991, undated (#2010): Financial ledgers and minute books produced by the company as it constructed and maintained the first bridge over the Brazos River in Central Texas, the Waco Suspension Bridge. From the opening of the Waco Suspension Bridge 1870 until 1889, the Waco Bridge Company exacted tolls on individuals wishing to cross the bridge. Pictured here is a blank pass found in the collection. You’ll find these items in the Waco Bridge Company records, 1868-1991, undated (#2010), box 1, folder 6, at The Texas Collection, Baylor University. [Belton] Southwestern Traction Company collection, 1913-1918, undated (#1511): Consists of legal documents about maintaining the rail line from Belton to Temple, and the construction of a proposed new line from Belton to Williamson County, Texas. Belton and Northeastern Railroad Company records, 1895-1898 (#1576): Correspondence and financial documents pertaining to the creation of a railroad in the 1890s to connect Belton to the Cotton Belt Railway via McGregor, Texas. Crush Collision collection, 1896-1983 (#1253): Includes correspondence containing eyewitness accounts of the famous intentional crash of two locomotives in Crush, Texas, on September 15, 1896. Tomlin, Henry. 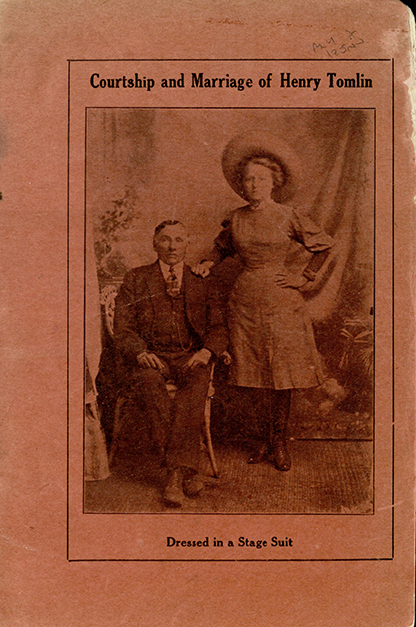 Courtship and Marriage of Henry Tomlin. [Dallas? ]: [publisher not identified], [1908?]. Print. Henry Tomlin explains the difficulties he had in marrying his 13-year-old bride due to her parent’s objections. Oddly, nowhere in the volume does Tomlin mention his fiancé’s name or that he is 53-years-old. He also doesn’t mention his nearly two-decade stint in a Texas prison in the late 19th century, which he recounts in another volume, Henry Tomlin: the Man who Fought the Brutality and Oppression of the Ring in the State of Texas for Eighteen Years, and Won. Click here to view in BearCat. H.J. Justin & Sons. 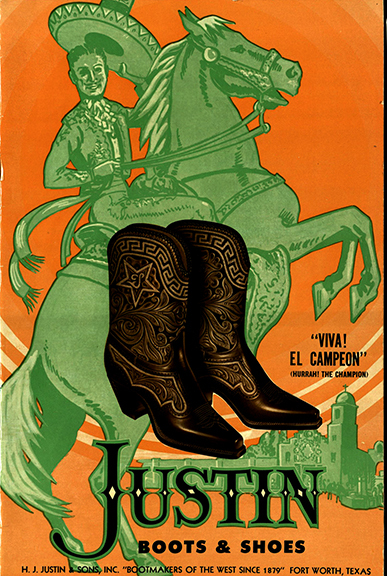 Justin Boots & Shoes. [Fort Worth? ]: [publisher not identified], [1947?]. Print. Touted as the “Bootmakers of the West Since 1879,” Justin Boots & Shoes has been making footwear for nearly 140 years. This circa 1940s catalogue shows the wide range of boots, cowboy shoes, and waddies available at the time as well as photographs of the boot manufacturing process. Click here to view in BearCat. Street Car and Bus Service in Dallas: Information for Centennial Visitors and Home Folks. [Dallas? ]: [publisher not identified], . Print. 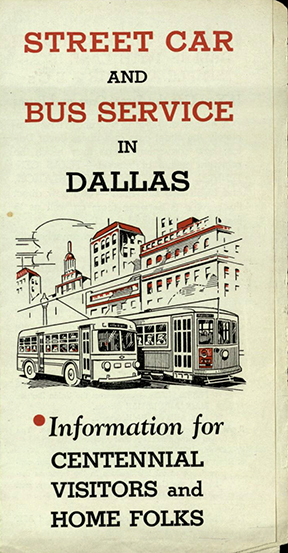 This informational brochure highlights the courteous, prompt, and safe modes of transportation that await those visiting Dallas for the 1936 Texas Centennial. A map showing the street car and bus lines is included and as well as info on how to get to popular attractions. Click here to view in BearCat.